If anyone out there knows how hard it is to start a new blog and get noticed, its ME. I sat there day after day in the beginning with my coffee in one hand, and my other hand on more forehead, just sitting there in frustration. How did they do it? What am I doing wrong? Even with the steps I am about to let you in on, it won’t happen over night. But with a little hard work and determination, you’ll get there, I PROMISE. 1) NEVER GIVE UP, ok that’s a given. Seriously though, keep up with it 3-4 times a week. Ever see that movie Julie and Julia? In the beginning, she was like “Hello, does anyone even read my blog?” But she never gave up and she became a huge hit. Ok, ya it was a movie, but if you give up, you’ll never know your blog’s full potential. 2) Always be thinking of new and exciting content. I’m going to steal a line from a previous blog tips post of mine: “Great content is an obvious choice. You’ve got to keep their ADD minds wanting more, because lets face it, even the most attentive readers lose interest easily“. Think outside of the box, and don’t copy everyone else’s ideas. While Pinterest is great for inspirtation, it can also be a trap. You can easily get too wrapped up in other peoples ideas. If you are going to use an idea change it up to and make it more exciting, Making your readers think to themselves, “So clever, why didn’t I think of that?”. 3) Reach Out to Other Bloggers. The world is huge and so is it’s internet. You can’t become instantly known over night. In the first few months of blogging, I had no idea how to get others to my site, or how to get followers etc. It hit me one day, that I had to ask other bloggers. I had to follow them, and ask that they follow back. If you’re like me it will feel a little like begging, but you’ve got to get creative. The more followers you have, the more other visitors will come. Making blog friends can lead you to other opportunities, such as sponsorship’s with brands. 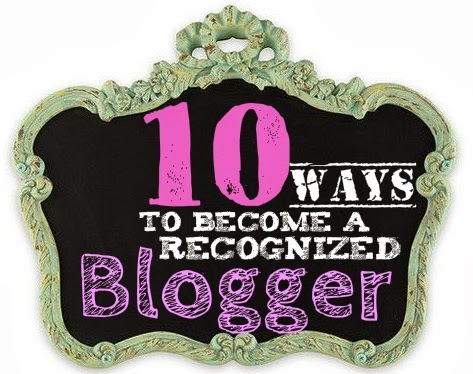 And in addition with other blogger friends, you can promote each other’s blog, which of course helps you get noticed. 4) Comment on other blogs. Adding comments to other blogs is a very good way to direct traffic towards your blog. If they allow links, you should of course always state your name at the end of your comment followed by your blog URL. Or… sometimes when I see a post that is similar to a project I blogged about, I’ll comment on how well of a job they did on it and as well will tell them about my project. Be careful not to brag. It should be more nonchalant, like say “Oh love this! I did something similar too.” and then add your link. Now you just invited that blogger to come on over, as well as anyone else who read the comments. 5) Social Media: I know it drives me crazy sometimes too! Its like a broken record. Sigh… its just the way it is, and its the avenue for your success. You can head straight on the road ahead, or turn the opposite way to a dead end, its your choice. So lets go over all the popular social media sites that will benefit you and your blog. Pinterest, yep its gonna be your number #1 traffic source. Uploading your posts with great catchy titles and a great lead photo will get you NOTICED. You will instantly see an increase in your viewing statistics. Facebook: I know a lot of people don’t like to use Facebook, they have gotten a bit of a bad wrap these days, but as long as their 1.23 Billion members keep using Facebook to catch up with friends and family, you’ll get noticed. Twitter: While I don’t use them as much, it is still a great way to announce my new posts. I notice a 30 view jump immediately when I post on twitter. With that said you need to follow and be followed by other bloggers who have related blogs. Instagram: Its becoming the next Pinterest. Only they don’t have the boards. But its a great way to get your photos and blog name out there. 6) Link Parties/Blog Hop Parties, will be your #2 traffic driving source. In addition to posting on social media sites, you also really need to link up your posts on link parties. I had no idea just how easy it was to gain followers and increase my views until I started linking up. My numbers went up immediately. Be courteous though, and follow the hosts. Follow their rules and visit other bloggers who have linked up. Its also a great way to meet new bloggers. 7) SEO: Search Engine Optimization: Yep its a mouthful all itself. It would take a while to explain it all and its benefits. But I’ll break it down for you quickly. GOOGLE is the #1 search engine in the world! Because of it you want your blog to be seen by Google. How do you do that? I’ll quickly list a couple of ways, but I highly recommend doing further research on it. Keywords: Search engines use the Title and Description, and other powerful keywords as a summary of what the page is about, so placing keyword within those tags is always helpful. Keywords should also be used throughout the content of the page. Search engines usually filter the first 200 words within a page. Therefore, its very important to place your keywords at least 3 times within the first few paragraphs. Labels: These are also known as tags. In your blog platform it will give you the option to add labels and or tags. This is your opportunity to list as many words that one might think of when searching for a particular article, recipe or project, etc. Hash Tags: Use a #with no space in front of any word that can be used to direct someone to your post. These are commonly used on twitter, pinterest, instagram and facebook. Add as many relative tags as possible. Like if its a bedroom makeover, put #redo #makeover #bedroom #black #white #hot #pink #Paris #theme #girls. I think you get the point. 8) Offer to Guest Blog and also accept others to guest blog on your site. Guest blogging is a fantastic way to spread your blog site’s seeds to those who have never seen your work before. Its a great way to say “Hey, if you don’t know me by now, come check me out”. Your blog post should be Spectacular. You want those readers to run red lights to come over to your site! 9) A Giveaway will help build traffic and encourage visitors to come back. In the beginning it will be hard to get sponsorship’s for your giveaways. So, skip over those steps in the beginning. Do your own giveaway, get creative and think of something affordable to you but something your visitors will want. Rafflecopter has free and paid plans, you can customize for your contestants to follow your social media sites for points to go towards the giveaway. 10) Visit and hangout where your targeted market gathers. This is one of the best ways to reach other bloggers and blog readers. If your community friends like your content, they will more than likely share it with others which once again = Love? Nooo, traffic to your site! Thanks so much for hanging out with me today. I hope these tips will help you with the success of your blog. It’s your baby, now help it grow!